Ever since my now-five-year-old daughter was born, I always dreamed of celebrating her 5th birthday at Walt Disney World. 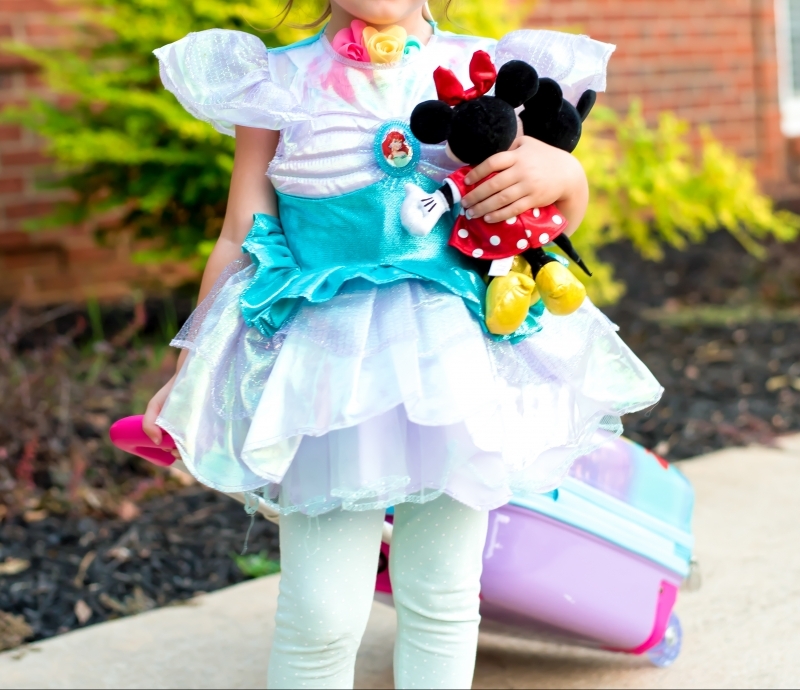 I dreamed we would surprised her with the trip like you see on all those viral YouTube videos online, we would dine with the princesses, and she’d get pampered at the Bibbidi Bobbidi Boutique. Well, I am so thrilled to say that my dream came true. This year, my oldest turned five. We had a small family birthday party at home like we’ve done in previous years and after my girls finished opening all their gifts (side note: my daughters are ages 5 and 3 and their birthdays are 2 days apart so we celebrate them together), we gave them the ultimate “We’re Going to Disney World” surprise gifts to open. After party clean-up that night, we donned our pajamas, jumped in the car, and headed to Florida! Today I’m finally sharing what was in their gifts and how we made the surprise memorable. 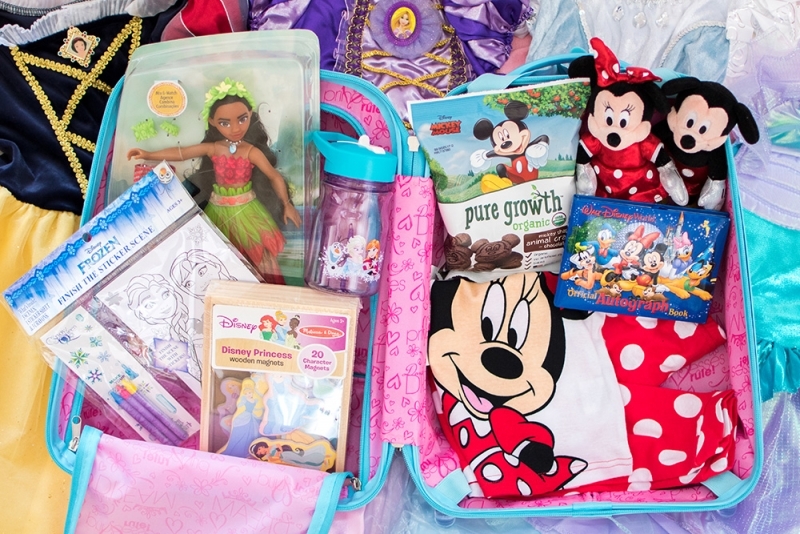 Disney Princess Suitcases: Because my girls have to travel in style! These were great because the hard case made it easy to wipe clean when they colored on them, they’re lightweight, and the perfect size for little ones! Princess Dresses: Costumes cost a small fortune at the park and I knew my girls would be excited about new dresses so they each received 4 new gowns; 1 for the Bibbidi Bobbidi Boutique and 1 to wear each day we visited the park. Mickey & Minnie Plush Dolls: I got these little guys to keep my girls company on the road. Plus, no trip to Disney is complete without Mickey & Minnie! Official Autograph Books: We used these to explain that they would get to meet all their favorite characters and get their autographs. Snacks: I can’t stress snacks enough! We needed them for the road trip and also for being at the park. To keep the Disney theme alive, I found snacks that are not only organic, but have Disney characters on the package! One bag of cookies were even shaped like Mickey’s head. Frozen Straw Cup: Because snacks make you thirsty! Melissa & Doug Disney Princess Wooden Magnets: These were great for the girls to play with in the car. I bought cookie sheets from the dollar store for them to stick to and they loved it. Moana Dolls: My girls love Moana and so they got to play with her in the car and at the hotel. Disney Pajamas: We drove to Florida from Georgia overnight so the pajamas were so my girls could ride in style. They were so excited to put them on! Frozen Coloring Set: They colored these in the car and at the hotel. The ones I got were from the dollar store but here’s a mess-free option! My girls went nuts when they saw their gifts and ripped the suitcases open so quickly! It’s a memory I’ll never forget and I hope they don’t either! How fun and I love the suitcases and you.are.the.best.mom.ever!! I wish I would have thought about packing dresses the last time we went, such a good idea! I can’t wait for my kids to be old enough to take them to Disney! This is the cutest Disney gear! Love it all! Ohhh how sweet is this!!! Is is sad that I want my hubby to do a bag for me? (ha!) I have still never been! Whaaaaaaaat?! Girl you need to go STAT! Oh my goodness! This is so cute! I love the little suitcases of goodies, too! Aw thank you! The suitcases are so darling, aren’t they?! Oh wow, this is amazing! My husband and I have the same dream for our future children. We go every couple of years just the two of us and we can’t wait to surprise our kids like this some day. Aw that’s so fun! I hope you get to! Is it odd that my kids DON’T want to go to Disney? I’ve asked (pleaded) with them, because my hubby and I have never been. They keep shutting us down. REALLY?! How old are they? That’s so hard to believe!